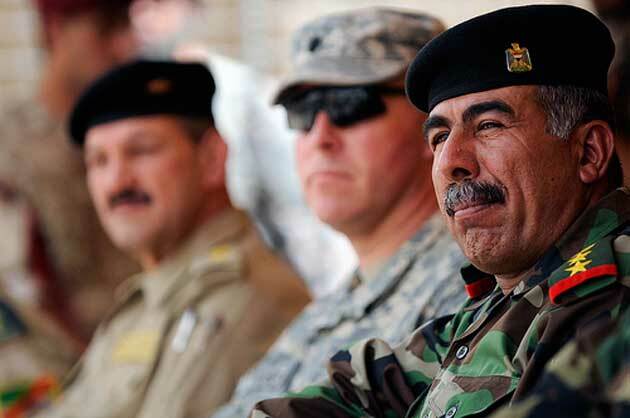 U.S. Army Lt. Col. Kenneth Casey (center), commander of 1st Battalion, 67th Armor Regiment, 3rd Brigade Combat Team, 25th Infantry Division, sits with Lt. Col. Hassan (front), commander of 2nd Battalion, 12th Brigade, 2nd Iraqi Army Division, during the turnover ceremony of Multi-National Force – Iraq, Combat Outpost Power in the Aden District of Mosul, Iraq, June 7. Tuesday was the official deadline for US troops to leave Iraqi cities. (Photo courtesy army.mil).